The recipient will receive an email on behalf of the user that send the message. Your recipient can then click the provided link to access the files. When you share a link with the Require Recipient Information option checked, the recipient will be asked to enter the following details for login. Note that these information is collected by Docsvault for tracking access log. If you have set password to access the shared link, the recipient will have to enter the password shared with them by you. 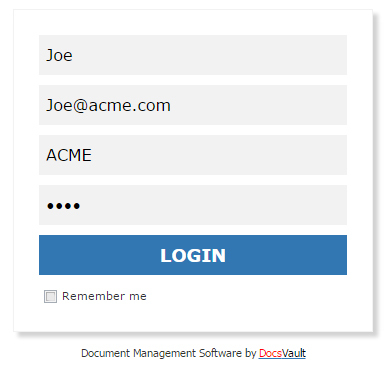 The recipient's name would be appear at top right corner,if 'Remember me' is selected while login. To clear this information, click on the username and select 'Clear Info'. When you share files/folder with 'Download' permission, your recipients can download the file you have shared with them or else they can just view it in Docsvault Previewer.